With the Megaforce jigging rods, DAIWA offers a range of fishing rods for the application at the North and Baltic Sea as well as for Norway. 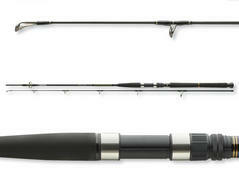 The Megaforce jigging rods are made of high modulus carbon fiber and feature a lightweight and pleasant handling. The somewhat softer tip action perfectly absorbs the runs of cod and Co. – especially when braided lines are used – and thus reduces the threat of losses during the fight. 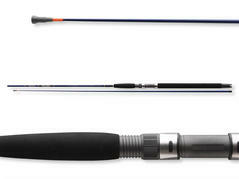 The handle is made of robust EVA and cork and allows convenient handling at fishing. Multi-sectioned and premium travel rods at an affordable price! Travel rods are trendy – these short-sectioned rods can be conveniently transported in a space-saving way. This eliminates the need for unhandy und expensive transportation tubes. Thanks to the application of spigot joints, the Megaforce rods feature an even bending curve, which is hardly distinguishable from a detachable rod. 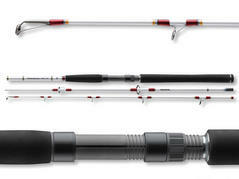 With the shortly divided four-sectioned BG Travel DAIWA, offers an equal travel series compared with the two-sectioned models, which will convince every sea fisherman. 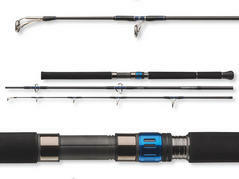 The lightweight blank offers an astonishing handling and enables optimum control also during the fight with large fishes. The BG Travel Pilk will become a reliable companion at your holidays. Matching with the BG reel series, DAIWA also offers a small series of jigging and boat rods for fishing at the Baltic Sea and in Norway. These rods feature a tip action with strong backbone – perfect for presenting pirks and shads with a tempting action as well as for absorbing headbutts of cod, coalfish and halibut during the fight. 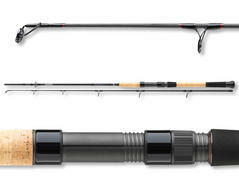 The brand Team DAIWA synonymously stands for reliability and quality since many years. The HVF carbon fiber blank, Fuji Alconite K-guides, the original Fuji reel seat and a premium Hard-EVA piece at the handle are only a few components, which underline the high quality standards of these multi-sectioned travel rods. Like the established two-sectioned series, also the three multi-sectioned models feature exemplary properties regarding action and handling. The very low weight in combination with the strong but nevertheless slim blanks ensure almost entirely fatigue-free fishing. With the Team DAIWA Pilk, DAIWA presents a range of premium saltwater jigging rods, which have been designed according to the requirements of Norway as well as of the Baltic and North Sea. The tip action perfectly absorbs head shocks of cod and friends and therefore reduces the threat of losses. The slim and lightweight HVF carbon fiber blank offers huge power reserves to force even large cods to the surface uncompromisingly. The Fuji K-guides reliably prevent tanglings at the guides by their special frame design. The Saltiga Ait Portable series has been especially developed for fishing in the tropics for GT, cubera, amberjack, rooster etc., which is gaining popularity. Due to the detachable construction these rods can be carried within your normal luggage, no additional, expensive rod tube is necessary. 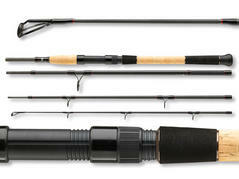 Depending on the model, these rods are also perfectly suited for fishing for cod, coalfish and halibut in Norway. SEALINE X'TREME TRAVEL INTERLINE 3-SECT. The design of a multipiece interline travel rod has posed a real challenge to our Japanese engineers, since this implies the transfer of the high quality standards of one-piece interline rods to a multipiece blank construction. After two years of development, we already recognized at the first field tests, that our engineers have accomplished a major achievement at designing these rods. 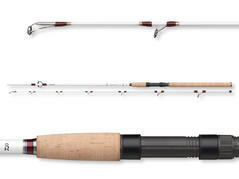 The action is nearly identical to that of a one-piece rod. SEALINE X'TREME TRAVEL INTERLINE 4-SECT. 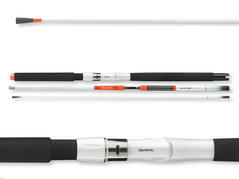 The DAIWA Interline rods are famous for their performance, especially at fishing in Norway. They are known to be uncompromisingly reliable and almost indestructible. After the 3-sectioned version last year DAIWA now presents a 4-sectioned series of Interliners, which fit into almost every suitcase. Perfect for fishing trips to Norway by airplane. The soft tip absorbs headbutts and fierce flights of halibut, cod & Co. and enables optimal bite detection. The strong backbone offers enough reserves to tire also large specimen. 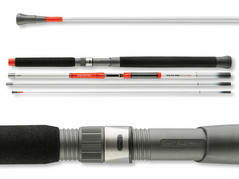 Fishing with interline rods is getting increasingly popular at sea fishing, since the interline construction offers essential advantages compared to conventional rods with guides. The strain is evenly scattered over the whole blank, ensuring an optimal bending curve and power transmission. Broken guide inlays due to transport or fallen over rods belong to the past. The line cannot be damaged at contact with sharp edges on the boat. If the SiC inlay of the tip guide nevertheless should get damaged, it easily can be screwed off and replaced. 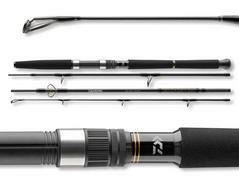 The Ninja rods are designed for the use of both multiplier and spinning reels. All digital catalogs of DAIWA GERMANY at a glance.